PJ Salvage is a premium America label established in the mid-90s. 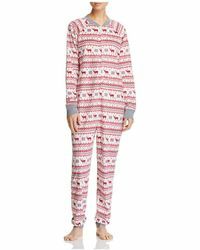 It is renowned for its superbly crafted sleepwear and loungewear that is perfect for relaxing, showcasing fine fabrics and fresh, playful designs across PJ Salvage jumpsuits, pyjama sets, night dresses, sweats and socks. For the PJ Salvage jumpsuits collection, expect to see a range of youthful onesies and jumpsuits accented with rainbow-bright colours and eclectic prints. These ultra-pretty designs are ideal for at-home attire with flawless style.